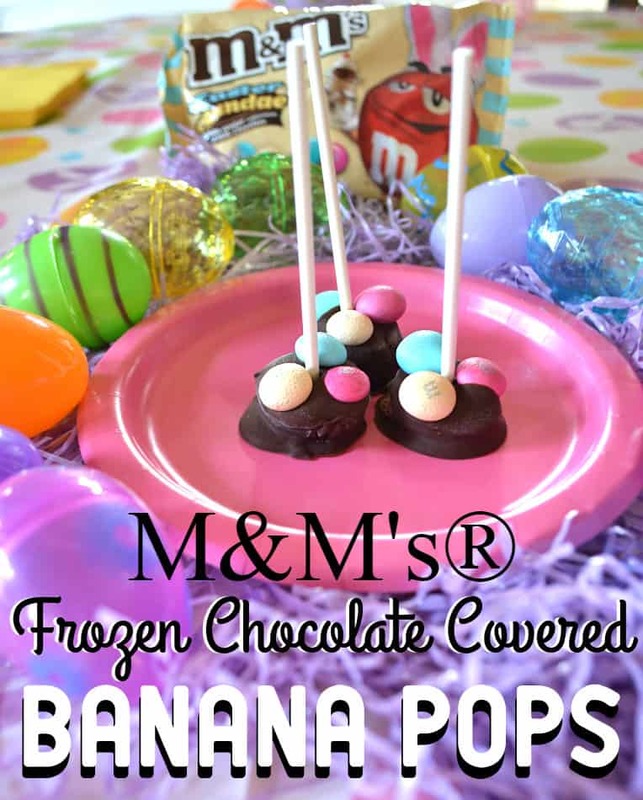 Chocolate Covered Frozen Banana Pops – chunks of banana dipped in dark chocolate & topped with M&M’s®. An easy & delicious Easter (or anytime) sweet snack. I’m excited! 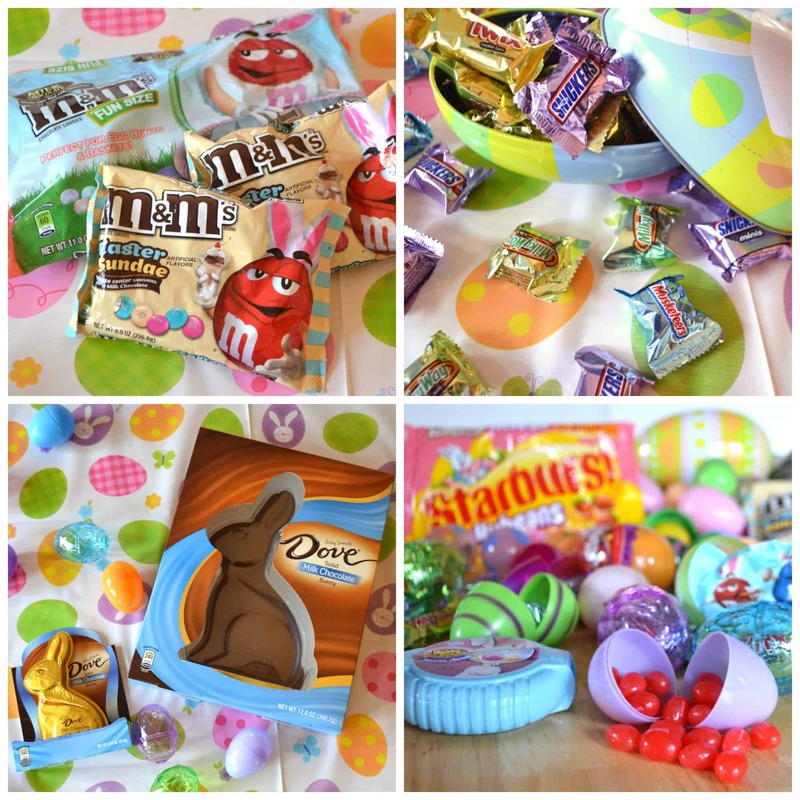 Easter is almost here and I have some fun ideas to share with you today! Holidays will change as you get older. Your joy for the occasion doesn’t change, but your approach to it does. It becomes about sharing the traditions you know and love with the children in your life. Recreating that joy for them. Traditions. What traditions do you have? Each year before Easter, a few of us get together to be “Easter Bunny Helpers”. It’s a super important job 🙂 We bake goodies and we paint & stuff eggs for a few local Easter Egg Hunts & events. It’s a lot of fun! Snacks while we work are a must. Cute, fun and festive snacks are even better. Quick & easy to make – the best! These delicious & adorable Chocolate Covered Banana Bites totally fit the bill! The hardest part of making them is melting the chocolate. Really, that’s not hard at all – but if you’re not familiar with it then it might be a bit tricky. The easiest way to melt chocolate (if it doesn’t need to be tempered) – throw it in a bowl, microwave for 30 seconds and stir. Continue at 20-30 seconds intervals, stirring afterwards each time. The chocolate should be melted and ready to dip after just a few rounds of this. I use two small forks to dip the banana and shake off the excess chocolate. 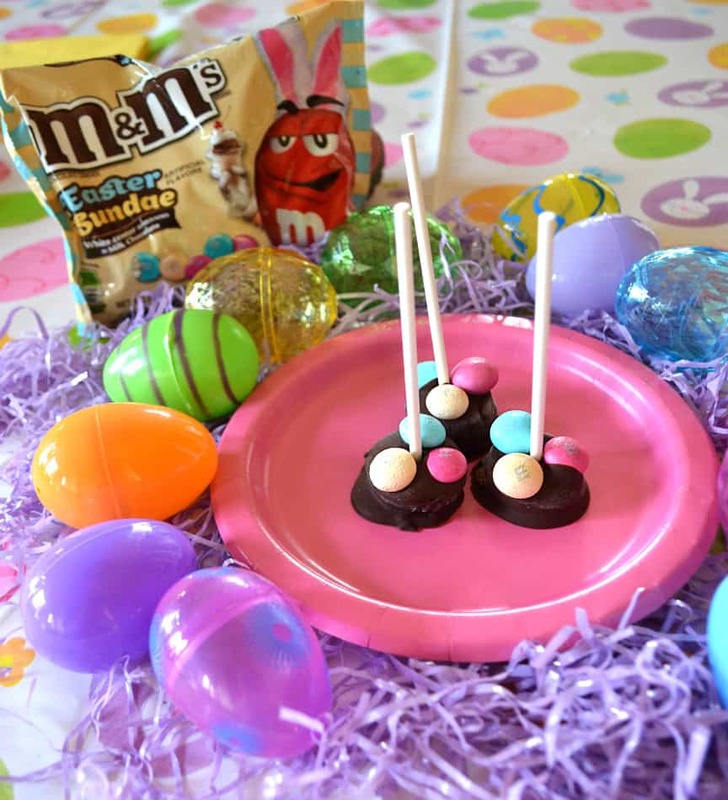 From there I pop a lollipop stick in the center, decorate the tops with M&M’s® Easter Sundae and continue on until all bananas are finished. Into the freezer they go until you’re ready to eat them. Yup, that’s it. Pull them out of the freezer about 5 minutes before serving & eat immediately. Yum! 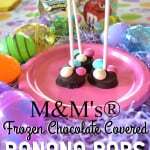 These M&M’s® Easter Sundae candies perfectly compliment my banana pops! I absolutely adore the pretty pastel colors! Plus the white center surrounded by milk chocolate gives these banana pops just the right amount of extra crunch and sweetness. I love making goodie bags and baskets for all the helpers. It’s a sweet little thank you – everyone loves bunny ears and Easter candy! A bouquet of fresh cut flowers complete the gifts. 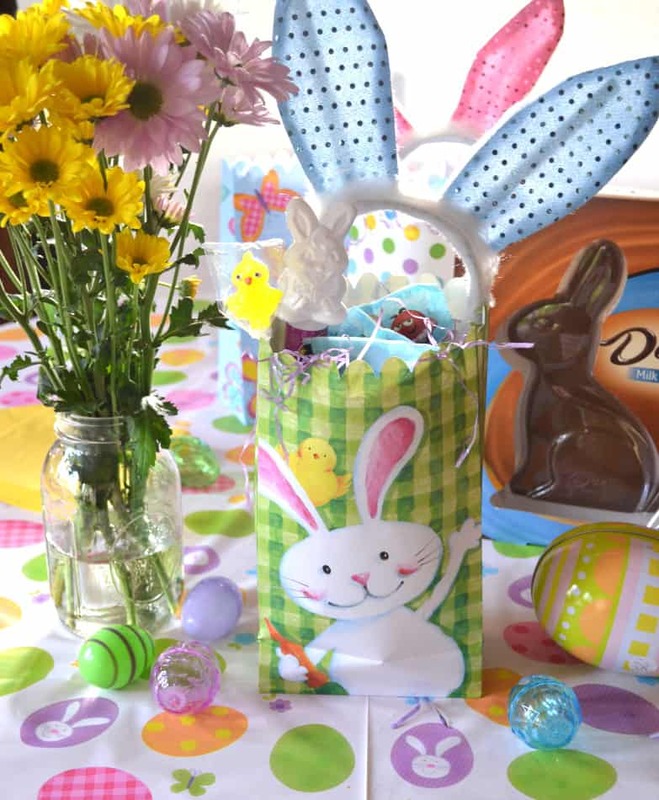 What’s going in your Easter bags & baskets this year? 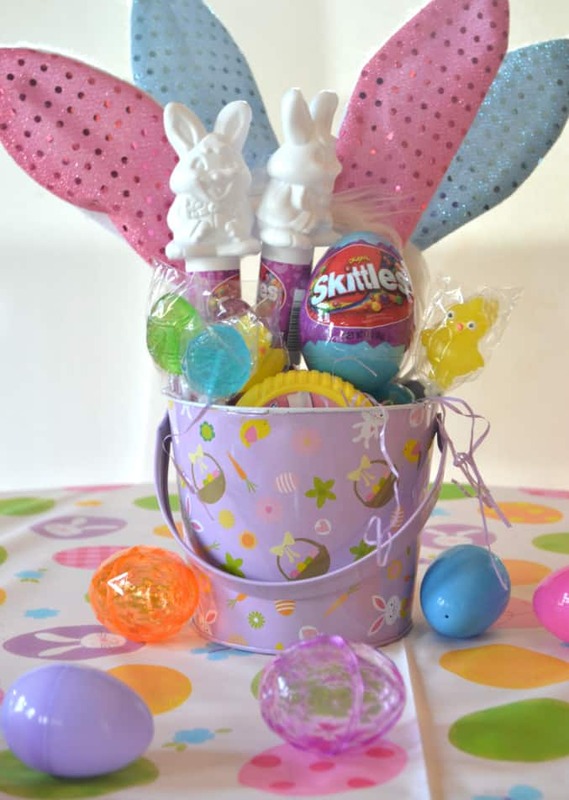 Need more Easter basket inspiration? Visit for fun & crafty ideas, recipes and tips on building your best basket yet! 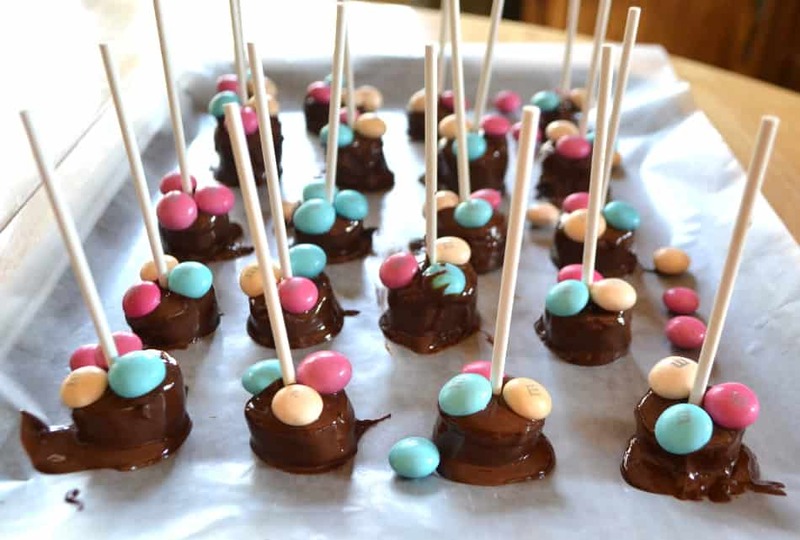 Chocolate Covered Frozen Banana Pops - Chunks of banana dipped in dark chocolate & topped with M&M's®. An easy & perfect anytime sweet snack. Prep a cookie sheet with wax paper. Set aside. Peel and slice bananas. I prefer the banana chunks to be about 1/2" - 3/4" thick. Set aside. Melt chocolate in microwave by short bursts (30 seconds, stir, 20 seconds & stir, repeat until melted - a few rounds should do it) or via bain marie. 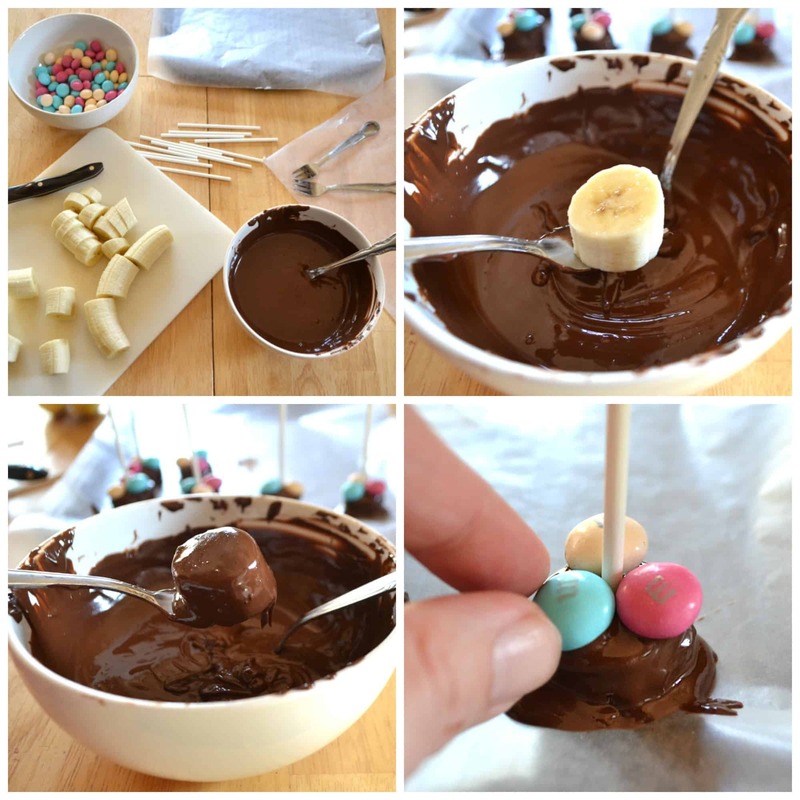 Using two forks, dip banana pieces in chocolate. Shake off excess and set on wax paper lined cookie sheet. Insert lollipop stick in center of chocolate covered banana. Place 3 M&M's® on top, around lollipop stick. To serve, remove from freezer, let sit for about 5 minutes before eating. Must be eaten immediately. These pops would not travel well. These look so cute, Amanda, and a great little project! I really love frozen banana and these are so much better for you than store bought sugar lollipops! Have a great week! Aaawww they’re adorable! I love the crunch the M&Ms add to these pops. I haven’t seen that flavor yet but I’ll be on the lookout now! These banana pops are too cute and would be fun to make. I like the idea of frozen banana pops and I don’t know one kid who would turn them down. 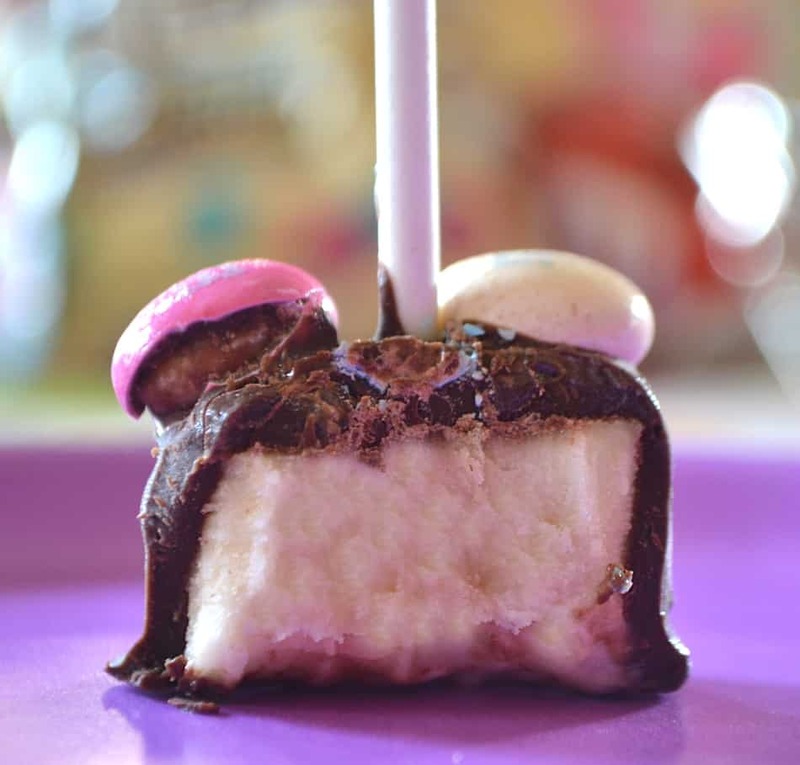 These chocolate banana pops are a cute idea. My granddaughter would love these. I love frozen banana and chocolate pops. 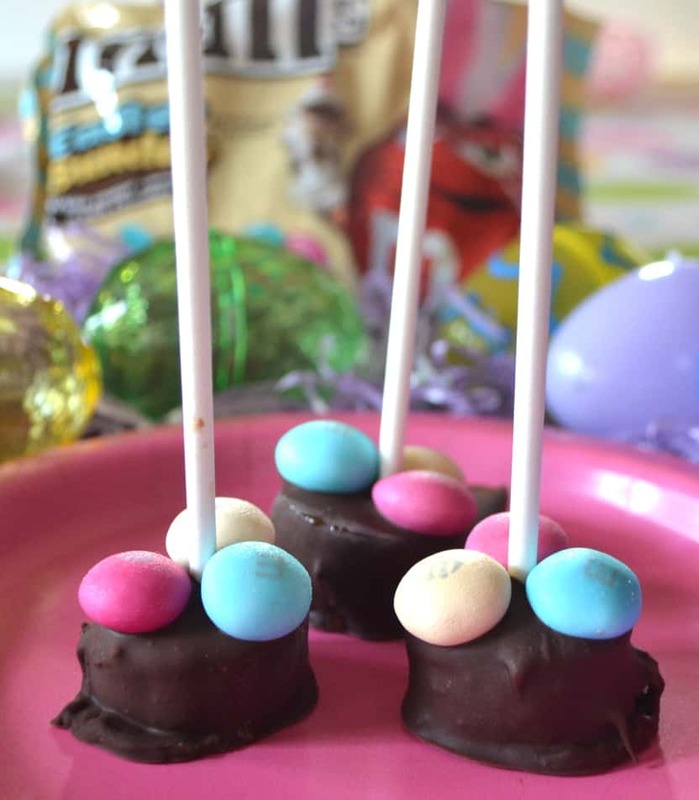 These are so cute, especially with the M&M’s and perfect for Easter. I don’t have little ones to make treats for this year since closing my daycare, but I know some adults who will love these just as much! Hi mommy! I can still taste the sweetness of them!